Sometimes EA escapes from making endless sequels and creates something beautiful. Boom Blox is a rare breed. It's an original game developed by EA and Steven Spielberg, and it evokes the nostalgia of childhood without being strictly a kids' game. It's full of bombs, lasers, and explosions, but it's not really a violent game. It takes motion controls and uses them intuitively and accurately, something most motion-enabled third party Wii games struggle with, to put it kindly. Most importantly, it's not a phoned in or watered down game that was rushed to production to cash in on the runaway success of the Wii. There was thought and care put into every ounce of Boom Blox, and it shows. 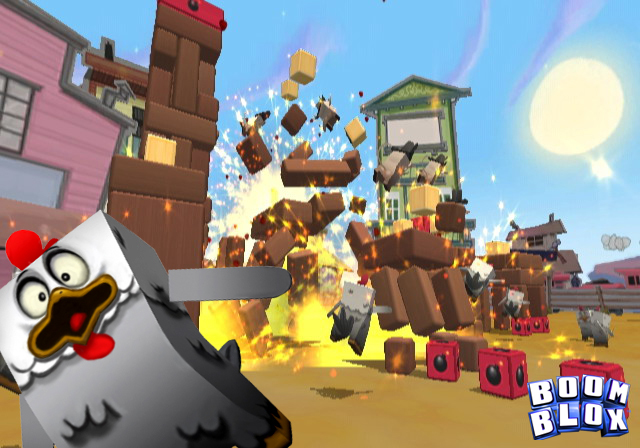 At its core, Boom Blox is a game about playing with blocks, which is a childhood activity of which I have many fond memories. My siblings and I would build forts, tanks, towns, castles, and more - whatever our imaginations could dream up, limited only by the number of blocks we had. This creative endeavor of building not only was pleasurable, but also stirred the mind. With the blocks we had, how would we go about creating what we pictured in our minds? There was also a visceral thrill in knocking down each other's creations, and we would often use the smaller blocks as projectiles once we had completed our structures. This brought a whole new level of problem solving, in learning how to fortify your buildings against attack. Having grown up and become a responsible adult, I had tucked those memories safely away, and hadn't thought of them in years, as there were important things to do. Working, paying bills, going to church... you know, adulting. 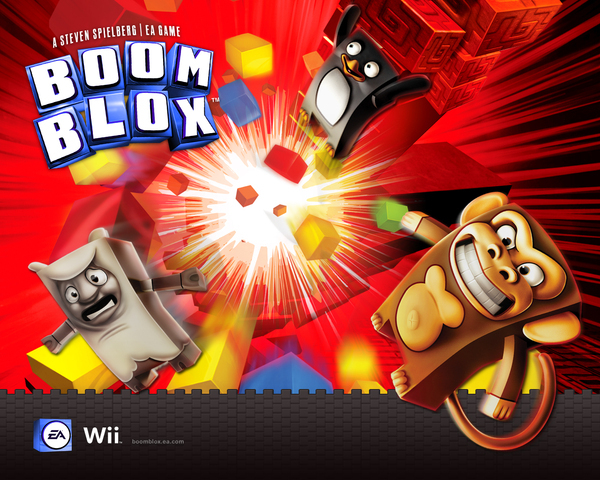 But the first time I played Boom Blox, it opened that vault in my mind, letting all those childhood memories spill out and wash over me. At that point, although I had never played it, I instinctively knew how. There is an elaborate setup of blocks. ...in joyful laughter and excitement as the blocks all come crashing down from the impact of the thrown ball. 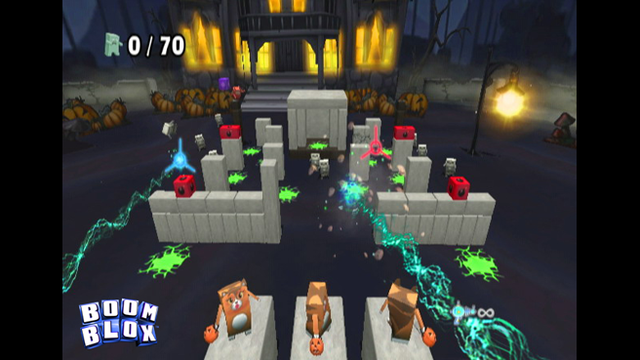 Unlike with real blocks, there's no sense of remorse or regret at demolishing these carefully crafted stages. Since they're all digital, they can easily and effortlessly be reset in the blink of an eye. No lost effort, no angry sibling wondering why you destroyed their lovely castle. These creations are meant to be destroyed; not just once, but again and again. It's like bubble wrap that can be popped forever. Yes, there's much more to it than just knocking things over for a lark. Sometimes, you'll need to knock gem blocks off a structure and to the ground. Other times, you'll be trying to knock only specific point blocks off, because there are penalty blocks that lose you points if they fall. Sometimes you have a time limit, other times you have a set number of throws available. Sometimes you'll be playing with bombs, or blocks that explode when they come in contact with each other. (I wish I had those as a kid!) You're not always just throwing things to blow stuff up or knock stuff down, either. There are a lot of different game styles, some that don't involve throwing at all. You could be grabbing and pushing/pulling blocks like in Jenga, you might be shooting lasers at them to make them disintegrate, or you might be spraying them with a garden hose. And within each of these styles, there are different objectives to offer even more variety. Granted, some of them fare better than others, but it's wonderful to see so many different ideas used. For example, I was not so hot on the levels where you throw bombs at invading animals to protect your crystals. On the other hand, I really enjoyed the levels where you use the hand to pull away gem blocks without hurting the gorilla babies. Thankfully, the levels are grouped together in sets following a particular play mechanic, so if you run across one you don't like, it's only a few minutes until you get back to the good stuff. Speaking of the animals, the game's Adventure mode is centered around them. In each section, a brief story snippet will be spelled out with delightful rhyming picture book-esque cutscenes, and you'll be tasked with helping a particular animal faction complete several goals. It's cute, and the animals are all shaped like blocks as well, which adds a sense of cohesion to this block world. The explore mode is basically the same - groups of puzzles following a specific mechanism. The only difference is there are no story cutscenes. It would have been incredible if all the puzzles had the level of narrative of the Adventure mode, but the Explore mode stages are just jump in and play. That isn't a bad thing necessarily, it just seems to needlessly complicate the menu to have two different options for what essentially is the same gameplay - and four options once you unlock some of the advanced challenges for each mode - given how simple the game is otherwise. 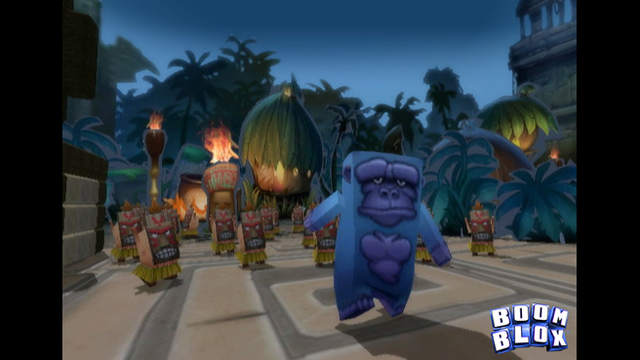 In addition to the single player, there are also a hundred or so multiplayer levels, both competitive and cooperative. All the competitive games are unlocked from the get go, but you'll need to work your way through the co-op challenges. Playing with friends makes this game even more fun. The controls in the game couldn't be simpler. You point at what you want to throw your ball at, press A to lock your cursor, then make a throwing motion with the Wii Remote. For the other tools, such as the laser, hose, and hand, they're equally simple. And in most puzzles you can rotate around the stage by holding B and moving the Wii Remote towards the edge of the screen. It's simple, intuitive, and works perfectly almost every time. The physics in the game deserve a nod, as the blocks balance, topple, and fall realistically. When you knock out a support beam on a tower, it's immensely satisfying to see it all come crashing down. The colorful, well-defined graphics help this game also. The textures are clean and the block types easy to differentiate. Additionally, all the blocks are square or rectangular, so there's not a whole lot of polygons being pushed at any given time. Unfortunately, there are still some spots in the game where the framerate stutters. There is also a full-featured level creator/level editor included in the game that lets you either make your own levels from scratch, or customize any of the game's existing levels. It comes with tutorial videos if you need them, or you can just start building, because the editor is pretty intuitive. Other than setting up the blocks, you can set the rules of the level, choose what can be thrown, add background details and animals, etc. The only big downside is there is a lot of stuff that is initially locked in the editor. So you have to play through the game before you can use everything, although you can still make some neat levels with just the basics. My profile is currently at 47% completion. On a system where practically every publisher in existence was rushing to release as many half-baked games with tacked on motion controls as they could (and some who came into existence just to sell said shovel-licious games), EA deserves to be applauded for releasing not just a great game, but one that really took advantage of the strengths of the Wii. Boom Blox is the complete package. It's not perfect, but it's a unique experience you can't get anywhere else. Games like this are why the Wii is still relevant today.